If you would like to download our specials menu, click here. Impossible? “Meat” made from plants! 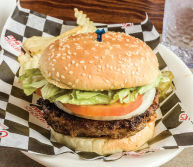 It grills like a burger, juicy & beefy taste. Iceberg lettuce, tomato, deli mustard, grilled onions all on a hamburger bun. Served with Chips. 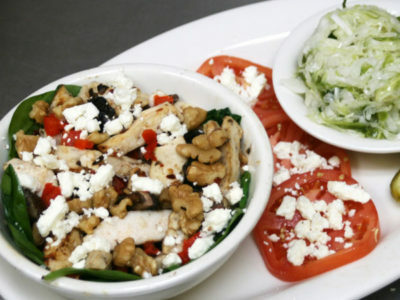 Our spiced fajita chicken, spinach, pimentos, and portabello mushrooms all grilled and topped with feta cheese & walnuts and served with sliced tomatoes, pickle chips and our vinegar slaw. 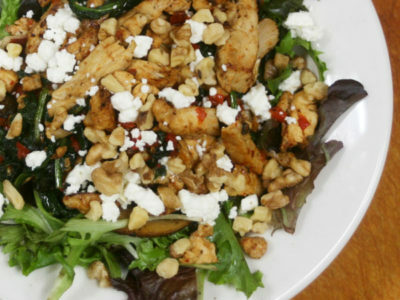 Our spiced fajita chicken, spinach, pimentos, and portabello mushrooms all grilled and topped with feta cheese and walnuts on a bed of fresh spring mix. Four of our NEW fried grouper fingers served with french fries and our zinger sauce.